Webinar: What Can Local Governments Do to Impact Food-Sector Greenhouse Gas Emissions? Learn about opportunities for local governments to reduce greenhouse gas emissions from the food sector. 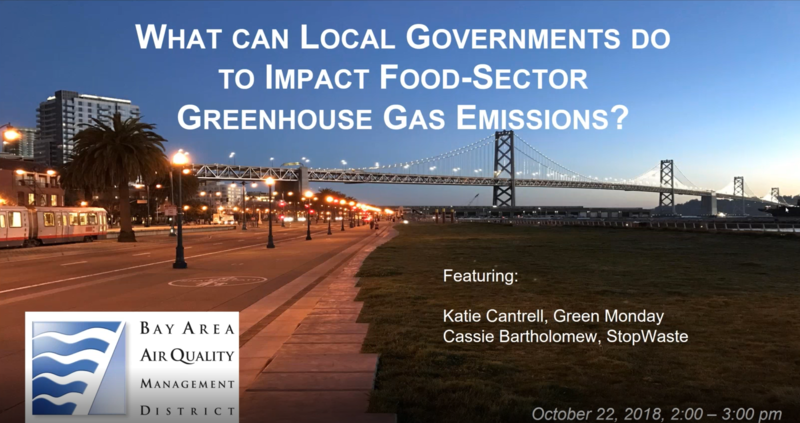 This recorded webinar showcases opportunities for local governments to impact greenhouse gas emissions from the food sector. Katie Cantrell of Green Monday and Cassie Bartholomew of StopWaste discuss how local governments can help to reduce GHG emissions from food production and consumption. Katie Cantrell speaks about the climate-diet connection, and innovative approaches that local governments are taking to reduce GHG emissions from food consumption. Cassie Bartholomew provides an overview of Alameda County’s effective and replicable food-waste reduction campaigns.